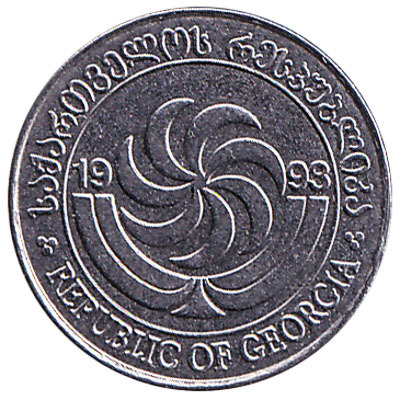 The National Bank of Georgia issued Georgian Lari coins in 8 different denominations, including this 1 Tetri coin Georgia. They are part of the Georgian Lari coins series. The National Bank of Georgia started issuing these 0.01 Georgian Lari coins in 1993. They are currently still in circulation. 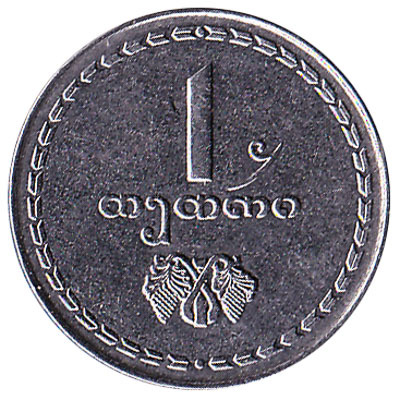 Georgia’s lowest value coin of 1 tetri is the equivalent of 0.01 lari. The stainless steel coin weighs only 1.4 grams and measures 1.5cm in diameter. It features the Borjgali: the Georgian symbol of the sun with seven rotating rays over the Christian Tree of Life. Repeat these steps for any other notes and coins you want to exchange. Complete checkout and get paid within 5 days of receiving your currencies. To exchange your 1 Tetri coin Georgia for cash: add it to your wallet now!